On June 26, voters made Oklahoma the 31st state to legalize some form of medical marijuana. 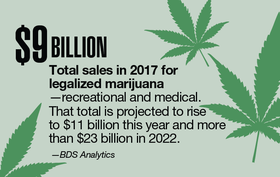 Nine of those states (and the District of Columbia) also have approved recreational use, so the legalized pot trade has become big business. In the eyes of the feds, all of this activity is still against the law, although President Donald Trump in early June suggested he'd support legislation that gave states the final say on legalization and enforcement. Given the vigorous debate over whether marijuana is a gateway to more drug use and addiction, the issue is far from settled. Download the PDF.